Numerous changes come to the 2016 Nissan Sentra compact sedan, designed to improve appearance, suspension and noise isolation, and upgrade driver-assist technologies with things like adaptive cruise control. Yet there's no corresponding bump in price, meaning the Sentra is still the same roomy, comfortable and value-laden little sedan it has been since this generation went on sale in 2013. What’s my absolute favorite of my car is the white powdery color. My original car that I wanted was a 2016 Chevy Cruze which originally came with Exeter window tint that had/and was the car I originally intended to by; my next car of choice was to go ahead and buy a Nissan Sentra sv press start sedan. It came with a intelligent smart key so they call it. Why I do not know works with a press of a button. Has front wheel drive; unlike the Chevy Cruze though it has excellent eco mode which is extremely competitive to most cars which I love helps save gas; sport mode which is also included, which is intended to use to get you out of any situation as far as sedan features which is a plus for me takes time and gets you to place to place in no time it helps speed up the car as it is used for a race car. Unfortunately didn't come with tint I purchased it all on my own. It was all used we I purchased it came with expensive tires firestone to be exact. A awesome cvt engine which means continuous variable transmission, can perform to its top beast in my very own opinion which is a great engine on the market right now. Flawless features suitable for sedan cross; came with backup camera when in reverse shift as well as USB auxiliary port and CD player. Although it is a great car and all does have two or three issues two I have no worries to take out my own pocket to have it running safe and well does have its needs. One is a well alignment does need its cvt transmission fluid replacement and a quick left rear back driver side ball joint leak which is in need of also an replacement I can do. Great for all around turns quick tight rough smooth drives when your on the road. It came as a cheap price sales taxes including totaled out to 13340 not too bad. Not done paying on it but when done I might consider selling for 5000. Would definitely come in handy for someone else. The best in style, efficiency, service, and features! Very easy car to drive. I have had it for about 2 years and have brought it to every maintenance check / service check and everything is still in check and running well. I the feature of the driver’s seat that can be lifted up with the handle on the side. This helps to raise your view when you are short like me. I also like the option to make the dash lights lighter or dimmer day or night. My eyes are sensitive to the light so I like dimmer feature when driving at night. Seats are comfortable both front and back and allows leg room for you are taller family members and friends. This Sentra can comfortably fit five people be it adult or children. And yes it has the safety features for you are youngest children to be securely locked in as well as the safety belt system to accommodate the babies in our lives to have their car seats stay put while driving on the road. A comfortable ride and gets you where you need to go. The dependability and reliability is why I trust the Nissan name. And yes! They have great and good looking SUVs and trucks too if those peak your interest. But for me, my Sentra does it all. . . Gets me where I am going and brings me home at night both safely and efficiently! Speaking of efficient, smart and spacious this Nissan Sentra looks more expensive than a lot in its category and has so many other wonderful features and options I could go on and on. Before I let you go my most favorite of all is the roomiest trunk space for a mid size sedan plus gives you the option to cruise to your destination or speed it on the highways and freeways. Please give the Nissan Sentra a place in your home because you will not be disappointed! I have had no problems with it whatsoever so it is a really nice car. One problem I have with the Nissan Sentra is that it needs a lot of gasoline on a regular basis. It is really reliable I have never gone into a crash and it is pretty safe. I am not sure how much horsepower it has but it is a really fast car so yeah. I recommend having a Nissan Sentra because it is just overall really good car. Another reason why I like the Nissan Sentra is because inside the seats are very sturdy and comfortable. The interior of the Nissan Sentra is very nice and snazzy. The front seats are reclinable you could adjust however you want in height and if you want to lay down or not. You rarely have to change the wheels on the car. The windows are very easy to clean along with the interior of the car. The trunk of the Nissan Sentra is very spacious, you can fit a lot of things in there, from scooters, skateboards, bottles, and groceries. 2016 Nissan Sentra First Drive Review: Refreshed but Ready to Compete? 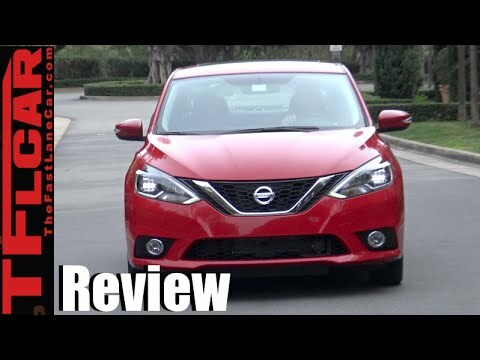 2016 Nissan Sentra First Drive Review - In 4K UHD! If the engine room harness loses connection to the ECU, the vehicle may not start or the engine may stall, increasing the risk of a crash. Nissan will notify owners, and dealers will replace the terminal pin on the engine room harness, free of charge. The recall began on August 15, 2016. Owners may contact Nissan customer service at 1-800-647-7261.